BUILT IN 1854, the Edina is still in active service after many adventures. She is an iron vessel, originally of 322 tons gross, built by Barclay Curie and Company and launched at Glasgow on May 5, 1854. This photograph shows how she appeared thirty years later, in 1884, after she had been overhauled and re-rigged with two pole masts. THOSE two wonderful steamships the Queen Mary and the Normandie have created a great stir throughout the world because of their enormous dimensions and speeds. There is, however, another wonderful vessel - one of the world’s oldest passenger screw steamers, the Edina, which is known throughout Australia as “The Old Lady of Port Phillip”. This veteran of the sea, after more than eighty years, is still in active service and trades between Melbourne and Geelong (Victoria), doing her daily run of over ninety miles. She has been described by the London Press as the “Peter Pan of the Sea”. as when she was built, without any subtraction or addition, in contrast to many other vessels. It is not likely that there will ever be another steamer in the future to have such a record, in view of the scrapping of liners such as the Mauretania, Olympic and Homeric, vessels that have had short careers. The Edina was launched on the Clyde on May 5, 1854, only about half a mile from the spot where over 200,000 people assembled to see the launch of the Queen Mary in September 1934. What celebrity performed the ceremony when the Edina took to the water is not recorded, but crowds witnessed her launch, for she was described by the Press as “making a majestic descent into the Clyde” from Barclay, Curie and Company’s shipyard. clipper bow. With three masts, square-rigged, she commanded the admiration of all ship lovers. Her first owners were the Leith, Hull and Hamburg Steam Packet Company (James Currie and Company), who still have a vessel to perpetuate the poetic name of Edinburgh. The Edina was not long in being fitted out after her launch. She took her maiden sailing to Hull on July 5, 1854, and continued to sail weekly for several months. Some months previously hostilities in the Crimea had broken out and steamships of all descriptions, including the celebrated Great Britain, were requisitioned by the Admiralty to take troops, ammunition, stores and horses to the Black Sea. The Edina was taken over on February 28, 1855. The first contract was for three months at the rate of £2 15s. per ton per month, and she loaded ordnance stores and horses at Deptford, sailing shortly afterwards for the Crimea. She had rather meagre accommodation, which had to be enlarged before she sailed, but she did not carry troops, as is frequently reported. As she was well equipped with sails, these were used with advantage and her coal consumption was thus economized - an important factor in those days. After the Crimean War the Edina was returned to her owners in March 1856, and for a time was placed in her original trade but, being a handy vessel, she was used for more important runs. After a thorough overhaul of her engines and boilers she renewed her association with the Mediterranean and brought cargoes of fruit to England. In 1861 she had a new boiler installed and shortly afterwards she was released from the Company’s regular services. In the same way as many other vessels of her class, she was diverted to the Atlantic, where she went to Galveston, Texas. During the American Civil War she made six trips from Galveston with cotton. In October 1861 the United States Government was employing about 150,000 men and 3,000 vessels to ship 2,000,000 bales of cotton which had accumulated, ready for export to England and France. The auxiliary Edina proved a useful vessel for the service. The discovery of gold in Australia and New Zealand induced thousands of people in Great Britain to emigrate to the Antipodes. When the Edina was released from the Atlantic trade she, too, went to Australia. She was a “young lady” then and, after having had her propeller detached, she left the Firth of Forth on November 23, 1862. After having cleared the east coast of England she entered the English Channel and had fine weather until entering the Bay of Biscay. There she encountered a severe buffeting in wintry weather, but came out unscathed. Thirty-five days out she crossed the Equator on December 28, and then met with light winds for three weeks, until she passed the Cape of Good Hope on February 28, 1863. From the Cape she had the usual stormy weather and her canvas was used to advantage in the roaring forties. The passage from the Cape occupied thirty-eight days, and the Edina arrived in Hobson’s Bay, Melbourne, on March 7. There had been no notification of her anticipated arrival and there were only meagre reports in the Press. The Edina was offered for sale and bought by Stephen Henty, a descendant of one of the early settlers. On April 2 she made a trip to the Western District ports of Victoria, including Warrnambool and Portland. Local papers were loud in their praise at the acquisition of so fine a vessel, and she had many passengers and a full cargo for the return trip. the sea abated efforts were made to refloat the vessel, and after three days the Edina was afloat again, and later taken to Melbourne and repaired. After the goldfields in the South Island of New Zealand had been discovered thousands of diggers were induced to go there, and all available vessels were diverted to that trade. The clipper ships such as the famous Lightning and Red Jacket also carried thousands of passengers and sheep to New Zealand, and when the Edina was placed in the service she, too, received much patronage. Her first trip was a stormy one, but she behaved perfectly, and arrived at the Bluff (South Island, N.Z.) none the worse for her experience. She made six trips across the Tasman Sea and travelled over 18,000 miles, carrying hundreds of passengers and bringing to Australia nearly 40,000 ounces of gold, as well as thousands of pounds of specie, which if computed to-day would be an enormous sum. Yet, in spite of many maritime gold robberies, the Edina had been lucky and landed her precious freight without the loss of a pennyweight. The owner of the Edina was induced to withdraw the vessel from the New Zealand trade and place her in the coastal run, a trade for which she was most suitable. Accordingly she renewed her acquaintance with the Victorian ports of Warrnambool and Portland at the end of 1863. It was customary for her to carry large quantities of dairy produce, bales of wool and a number of live stock and pigs. She built up a remunerative trade and brought considerable profits to her owner for many years. THE EDINA IN 1863 was transferred from the New Zealand trade to the coastal run between Portland and Warrnambool, Victoria. She was most successful as a carrier of dairy produce, live stock and bales of wool. In 1868 she was sold to a new company for £9,500 and continued in the same trade until 1875. A new shipping company was formed at Warrnambool in February 1868. As the Edina was under offer she was bought for £9,500, and continued in the trade under the new flag. The Edina had been running for twelve months for her new owners when her career almost came to an end. While passing the dreaded Port Phillip Head early in the morning of April 30, 1869, she struck what seemed to be a submerged object. This was the outer end of the Lonsdale Reef, a spot where many vessels in the past had been wrecked, and many since have found a grave. She managed to float off the reef, but it was discovered that her stern was getting deeper in the water. After her hold had been examined, it was discovered that water was entering. The pumps were then set working, and by great skill she was taken to Williamstown, at the mouth of the River Yarra, and was placed in shallow water. On that occasion she had a number of passengers, a full cargo and 120 pigs. After repairs had been carried out she re-entered the trade, but only for a brief period before another mishap befell her. While completing another voyage from the Western District ports she went ashore on June 17, 1869, in a wintry fog, prevalent at that time of the year, on Point Gellibrand. On that occasion she had many passengers and her usual large consignments of dairy produce. Fortunately she grounded where there was plenty of mud, but only a few yards from a rocky reef. A boat was sent to the shore, and soon a tug appeared on the scene, but all efforts to shift the “young lady” were fruitless. A lighter was engaged and 430 bags of potatoes were taken off, as well as the pigs. Two tugs, appropriately named Hercules and Resolute, managed to tow her off before any damage was done to her hull. In 1870-71, after constant employment, it was apparent that the vessel was getting on in years and needed a complete overhaul. So her owners decided to spend some thousands of pounds on her refit, and at the same time to effect a number of improve-ments. For four months she was out of commission, and when completed she was almost a new vessel. A new poop, 42 feet long, was added for steerage passengers, and new cylinders were given to her - engines. Her figurehead, “ The Fair Maid of Judea”, which had been damaged, was replaced. The Edina made a trial trip to New South Wales on October 13, 1873, and gave great satisfaction to all. Shortly afterwards she took up her old running. Several new steamers were being built for the trade, and her owners decided to dispose of the Edina, which had made no fewer than 1,000 trips to and from the Western District, She was submitted to auction on May 27, 1875, a few weeks after having celebrated her twenty-first anniversary. She was bought by the late Captain William Howard Smith, founder of the steamship line which for many years bore his name. It is owing to his enthusiasm that the Edina has been retained up to the present. After his death his son, Mr. H. B. Howard Smith, also took an interest in her and made an idol of the vessel. After her change of ownership she was placed on the Queensland coastal trade, and became one of the most popular vessels for several years. Because of the advent of new and up-to-date steamers, the Edina had to give way, and retired from that trade in February 1879, She returned to Melbourne, where she was altered for the Melbourne and Geelong trade. ASHORE ON POINT GELLIBRAND near Williamstown, Victoria. 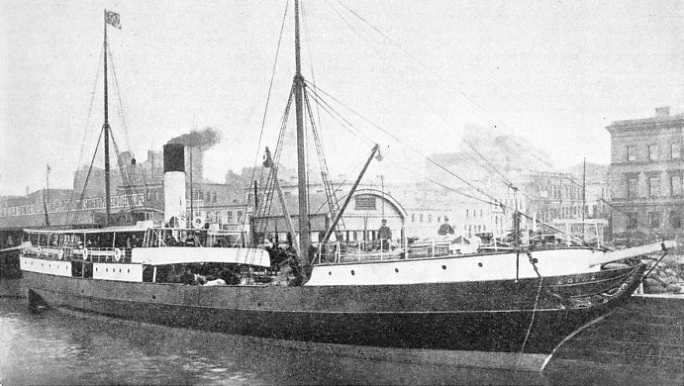 On April 27, 1898, the Edina was nearing Williamstown on the run from Geelong to Melbourne, when she collided with the wooden steamer Manawatu. To prevent her from sinking, the Edina's captain ran his vessel ashore She was soon refloated, docked and repaired This illustration is from a drawing by C. Dickson Gregory. After the necessary alterations had been made and the rig entirely changed - one mast-instead of three - she started her new career on May 3, 1880. In 1883 she underwent another extensive overhaul and had new boilers installed. Again her rig was changed - to two pole masts, and she had a fine appearance. After a satisfactory trial trip to New South Wales, she re-entered the Geelong trade to meet a rival, the Excelsior, a new steamer owned by Huddart, Parker and Company. For some time great competition in the trade ensued, but the Edina always was the popular vessel and received a fair share of patronage from the “Bay trippers”. 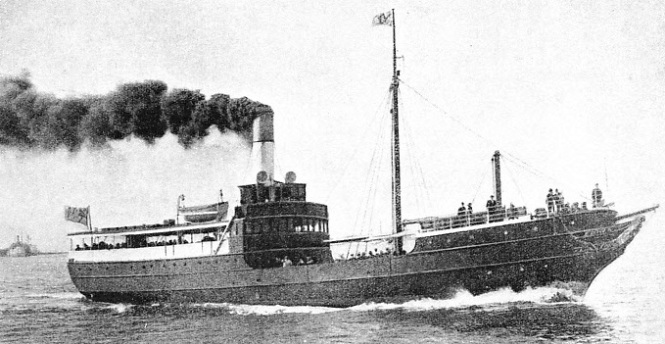 In 1887 the palatial steamer Courier, 728 tons, was placed in the trade, and became a great rival to the Edina, yet the veteran still held her popularity. The Edina had made more than 1,000 trips to Geelong, and had traded for more than eighteen years without having a serious mishap; but on the evening of April 27, 1898, when nearing Williamstown, Victoria, she met the wooden steamer Manawatu, outward-bound. The Manawatu came over and gave the Edina a severe blow amidships, causing a great gap above the water-line. The attacking vessel had her bows greatly damaged. It was seen that she was settling by the head, and her crew took to the boats before she sank. The Edina’s captain, realizing the great danger of his vessel also sinking immediately, ran her on Point Gellibrand, where she heeled over and prevented the water from coming in. She was refloated a few days later and taken into dock and repaired. The peaceful relations between the Edina and her competitors were interrupted on July 11, 1899, when a thick fog suddenly came on during her voyage to Geelong. Her speed was reduced and her fog-horn sounded, bill despite it all her rival, the Excelsior, appeared in the mist and the Edina struck the Excelsior on her port side near the stern. Both vessels had many passengers, and it was obvious to all that the Excelsior was sinking. Boats were lowered, and some passengers jumped on to the Edina’s bows. When all were safely on board the Edina the Excelsior sank by the stern and only her mast could be seen. The clipper bow of the Edina had averted a terrible maritime disaster by breaking the force of the impact. In 1917 the Edina was withdrawn from the trade, and as the war of 1914-18 was then raging, the building of a new steamer was out of the question. Her owners decided, therefore, in view of the fine preservation of her iron hull, to give her once more a complete overhaul. She was entirely gutted and parts were renewed where necessary. When she had been completed her regular patrons were surprised at the wonderful improvements made internally and externally - new mast, funnel and extended promenade deck. She resumed her running to Geelong and has been continually employed ever since. Her rival, the Courier, after forty years service, was dismantled and sunk. On July 9, 1924, the Edina failed to reach her customary berth and alarm was felt for the ship. There was a thick fog, and later news came that she was aground on her favourite spot - Point Gellibrand. The tugs Racer and Sprightly soon went to her assistance, but the Edina would not budge. The following day she was floated off and soon on her run to Geelong, where she had already steamed over 900,000 miles and carried 1,100,000 passengers. Captain W. C. Forbes, her former captain, was in charge of the veteran for forty years and made about 12,000 trips to Geelong. In July 1931 the Edina became involved in another collision, when she sank the tug Hovell at the mouth of the River Yarra. In September 1932 the Edina was sailing to Geelong and soon after she had left Portarlington a thick fog enveloped the vessel. She went aground and her 128 passengers had to be taken off in fishing boats. When a tug came later, the elusive Edina was not to be found, and was forced to remain a night on the sandbank. She has carried tens of thousands of passengers between Melbourne and Geelong and generally has a contingent of 503 on public holidays. People always relish a trip in the “old Edina”, as they affectionately style her, and it is to be hoped the old vessel will continue and reach a century. The principal event of the Centenary of Victoria in 1934 was the visit of H.R.H. the Duke of Gloucester when he visited Australia in HMS Sussex. The Edina was the first vessel to greet the Sussex with a signal message: “Welcome to the Duke.” As the Edina passed the Sussex her flag was dipped in a salute, which was duly acknowledged. THE EDINA in 1936 was still running between Geelong and Melbourne, after eighty-two years of service An iron vessel, now of 383 tons gross, she has a length of 171 feet, a beam of 23 ft 7-in and a depth of 12 ft 8-in. She is registered at Melbourne.